I always think “Snugglepot “or “Cuddlepie”. 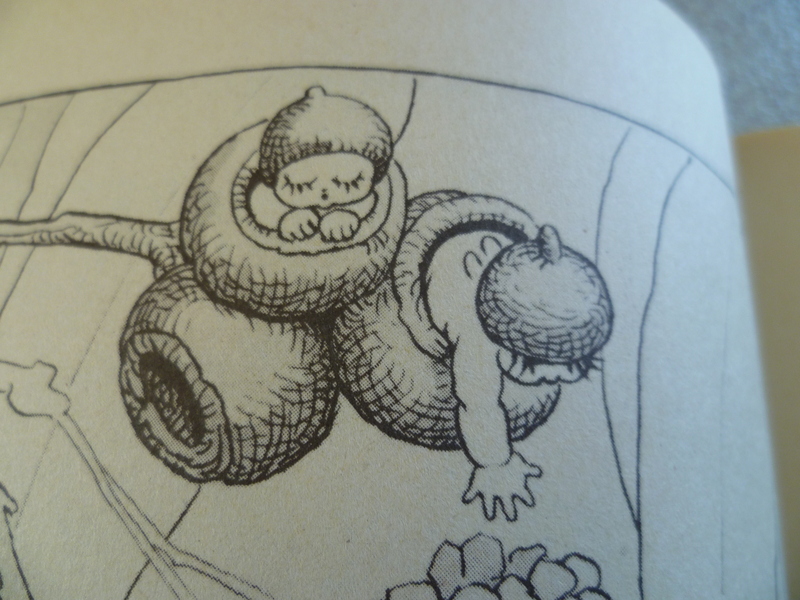 Snugglepot and Cuddlepie are the main characters in a classic book from my childhood. They are not cats but fictitious Gumnut babies. The book is The Complete Adventures of Snugglepot and Cuddlepie, written and illustrated by May Gibbs. 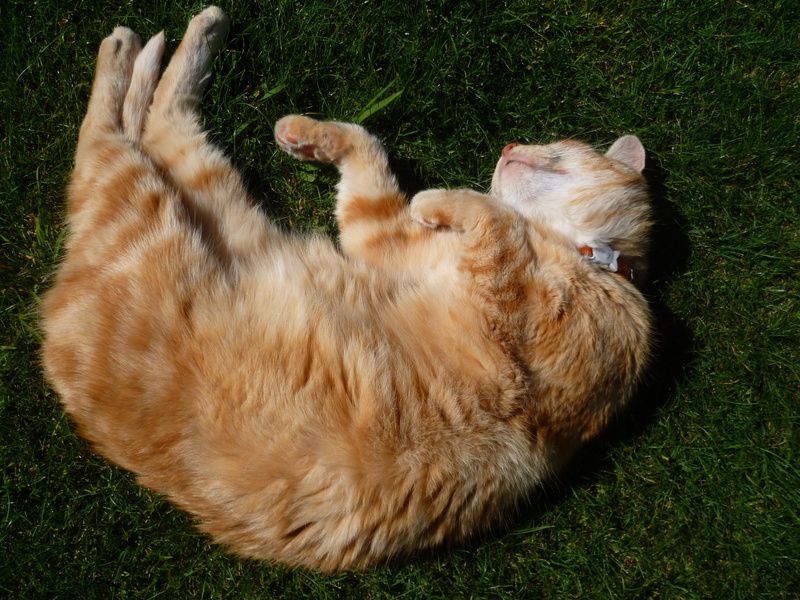 So, why does a sleeping cat make me think of Gumnuts? I am not entirely sure. My mind works in strange ways, but there are three possibilities. The first is the cuteness factor. Here are Snugglepot and Cuddlepie sleeping in their” second-hand houses”. And, here, they are overlooking a busy highroad. Snugglepot is helping himself to a grassroot bun. How cute are those illustrations! The second possibility is to do with comfort, or a type of security blanket factor. My siblings and I were lucky to grow up with the comfort and security of bedtime stories. 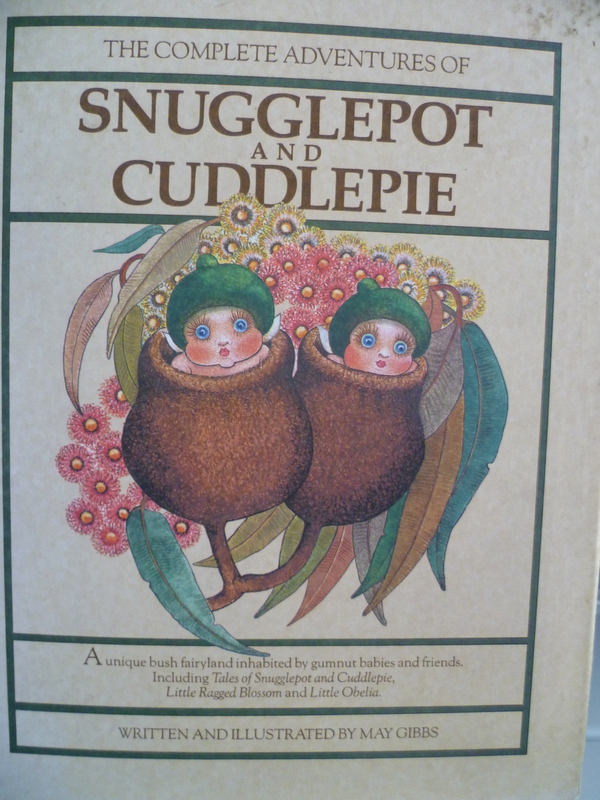 I don’t remember Snugglepot and Cuddlepie being read to me but I do remember being cuddled up next to my sister, at bedtime, and reading it to her. I associate Snugglepot and Cuddlepie with sweet and gentle times and the notion “That all will be well”. 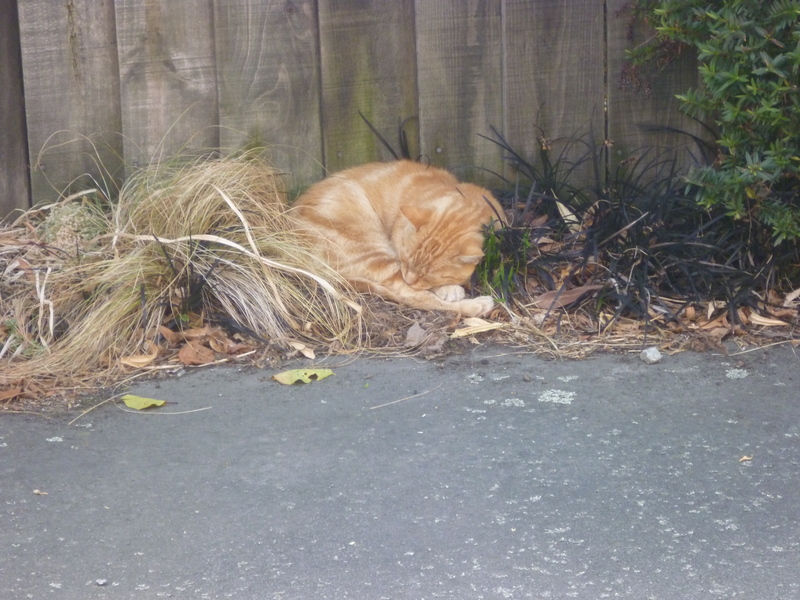 Just as the sight of a peacefully resting cat reassures me that there must be a rightfulness to life, even if I can’t always see it. May Gibbs( 1877-1969)( http://www.nutcote.org/) was Australia’s first full-time, professionally trained children’s book illustrator. She developed a uniquely Australian fantasy world . 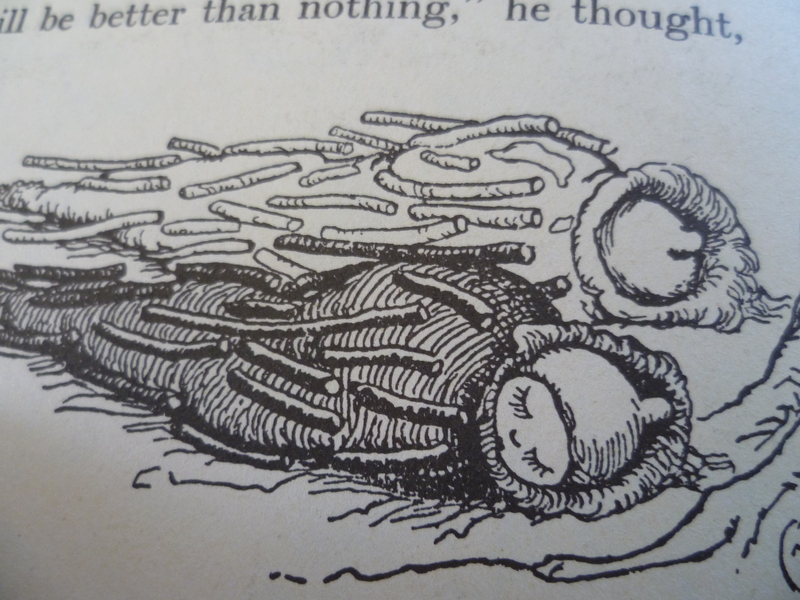 The first book about Snugglepot and Cuddlepie was published in 1918. May Gibbs not only brought great stories to children but, in her will, she remembered them by bequeathing the copyright from the designs of her bush characters and her stories to Northcott Disability Services and the Cerebral Palsy Alliance of New South Wales, Australia. The rest of her estate was left to the United Nations International Children’s Emergency Fund. 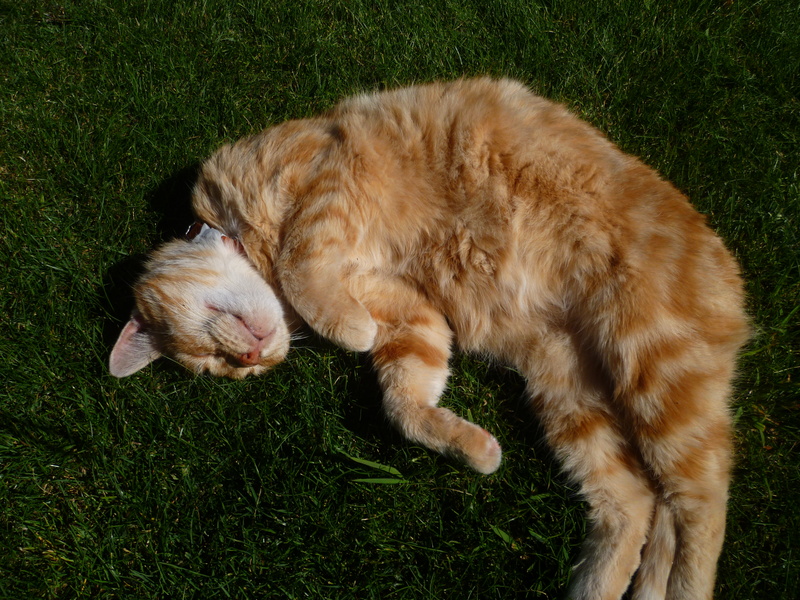 This entry was posted in Animals, Books, Domestic, Flowers, Memories and tagged © silkannthreades, bedtime stories, Cats, family, ginger cats, heritage, illustrators, nature, perspectives, writers on February 26, 2013 by Gallivanta. No caterpillars, no computer, no butterflies, no earrings; just Swans! My faithful five-year old laptop decided to have a tantrum last week, followed by a meltdown. Ditto for me when it happened. I am hapless and brainless without my technology. My son kindly agreed to lend me his laptop until mine is repaired ( hopefully it is repairable ). It is wonderful to have a laptop again but my son’s is so much newer than mine that I hardly know what to do with it. It makes me feel as though I am back in school struggling with long division. However, in the spirit of having a go, here is my first attempt at a post from a strange (to me) laptop. 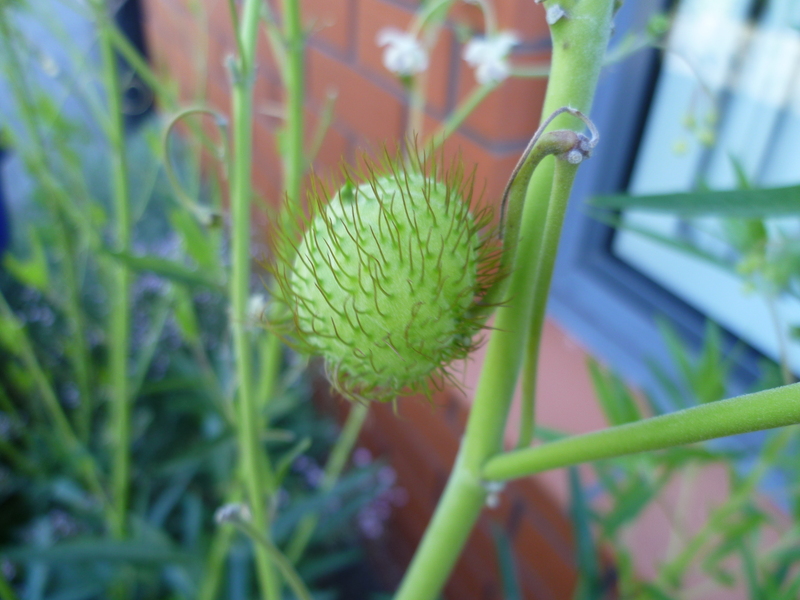 The caterpillars on my swan plants are no more. They are all in their cocoon stage. One of the cocoons looks almost ready to be a butterfly The others are still cogitating and storing up memories. The swan plants are putting out new leaves and, at the same time, they are producing the swans that give them their name. Here are the swans; not sure if they get any more swan like when the seed balloons open. 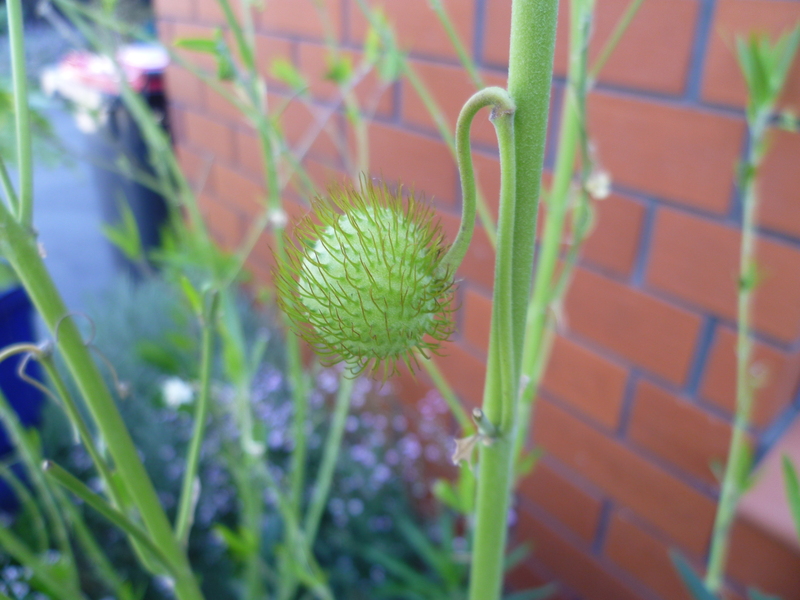 Apparently the seeds have silky tufts. The swans and the cocoons make me think of pretty earrings which is, perhaps, why I almost bought a pair of pearl drop earrings this afternoon. Almost; they weren’t very expensive, for pearl earrings, but I thought, “No, that money will pay for a laptop assessment. Restrain your impulse shopping!” So, I came home, minus new earrings, to write this post. This entry was posted in Animals, Domestic, Flowers, Gallivanting, Jewellery, Memories and tagged © silkannthreades, butterflies, caterpillars, change, Monarch butterflies, pearls, royalty, swan plants, swans on February 24, 2013 by Gallivanta. 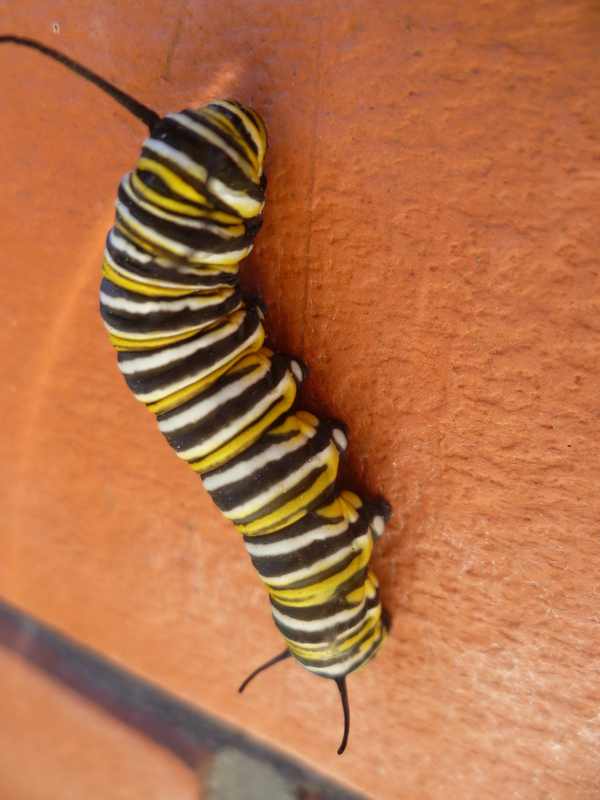 Yesterday’s adventurous lone long ranger, the monarch caterpillar, is now my new lodger. 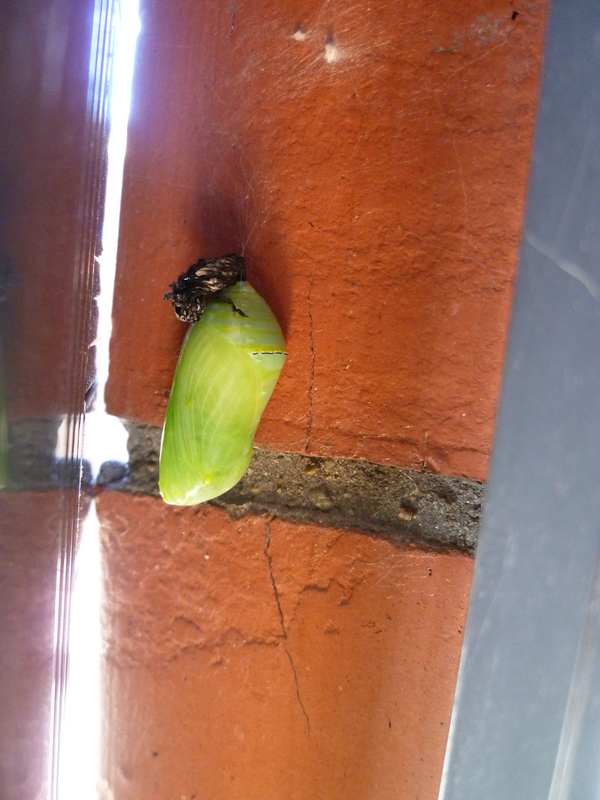 It is settled in to its cocoon and is safely attached to the brick work at my front door. It is in an ideal position for me to keep an eye on it. Thank you, little critter, for choosing my home for your confinement. Footnote: I must remember to put a DO NOT DISTURB sign next to my lodger before the window cleaner comes tomorrow. This entry was posted in Animals, Domestic, Gallivanting and tagged © silkannthreades, change, cocoons, lodger, Monarch butterflies, nature, royalty, Wanderlust on February 20, 2013 by Gallivanta. Yesterday I read a fascinating post on the theme of Wanderlust in far off South America. (http://playamart.wordpress.com/2013/02/18/the-wanderlust-breed/ ) Little did I expect that, this morning, I would witness something very like Wanderlust at my own front door. 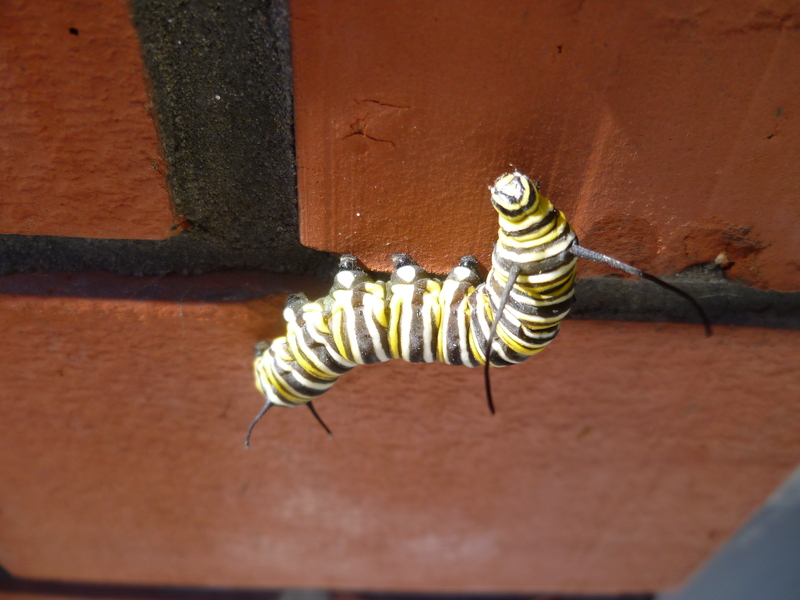 Here it is; a solitary monarch caterpillar climbing up the brick facade of the house. What possessed this little creature to travel at least 15 metres from the other caterpillars and cocoons. Why was it not happy to stay near the others and the security of the swan plants and other vegetation? Does moving to the hot bricks of my front door, give it a competitive advantage? Or is it just an insatiably curious caterpillar full of wanderlust and the spirit of adventure? 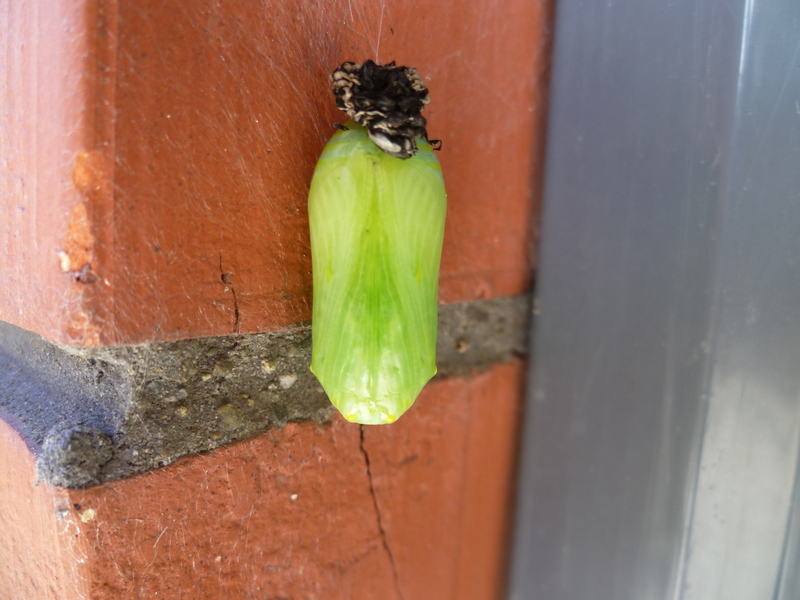 Tomorrow I will see if there is a cocoon decorating my bricks, or if the caterpillar has continued its wandering lone, long ranger journey. This entry was posted in Animals, Domestic and tagged © silkannthreades, caterpillars, change, cocoons, Monarch butterflies, nature, royalty, Wanderlust on February 19, 2013 by Gallivanta. whilst some prefer the shade. 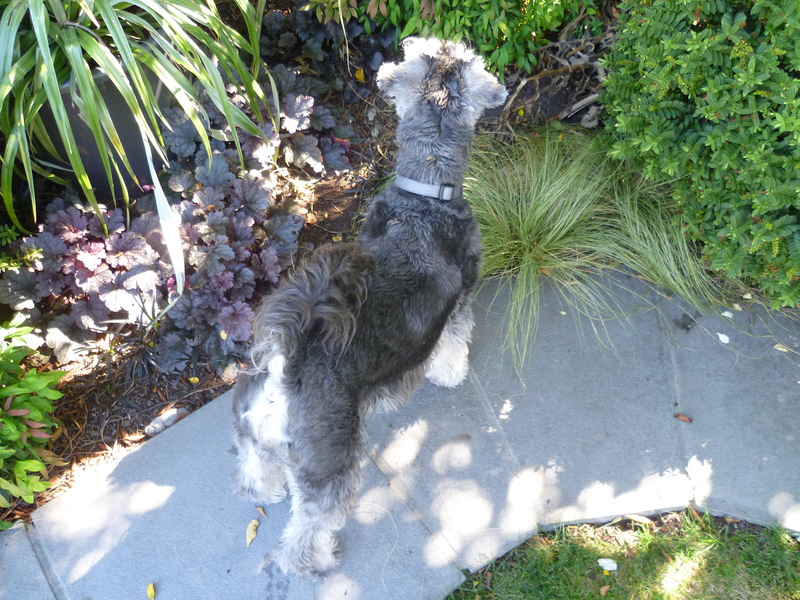 Besides, the shade is closer to the fence and the fence is closer to mysteries which need a good barking to. 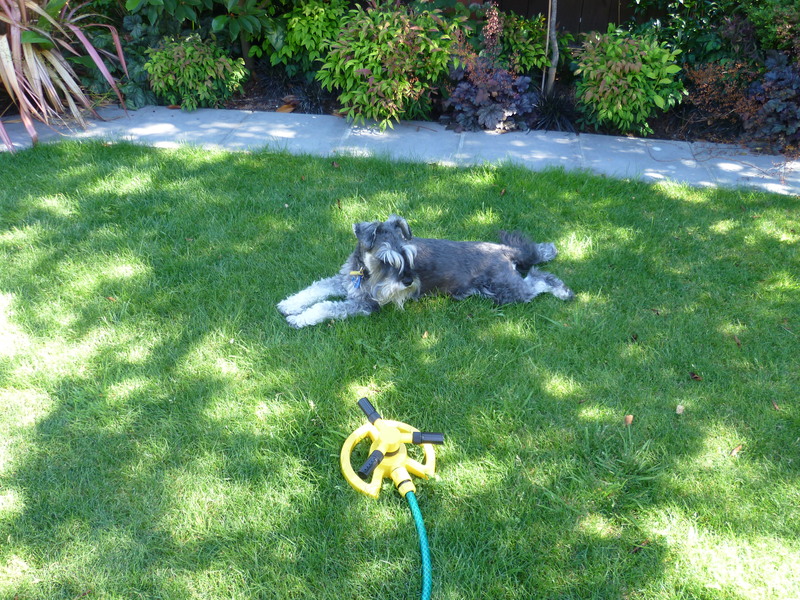 This entry was posted in Animals, Domestic, Flowers, sunshine, Trees and tagged © silkannthreades, Cats, colour, family, gardens, ginger cats, miniature schnauzer, nature, peace, perspectives on February 19, 2013 by Gallivanta. I had a couple of dizzy spells during the weekend. I didn’t, and don’t, feel unwell, so maybe the dizziness was caused by insufficient fluid intake or, perhaps, it was my body telling me to put my feet up for a while. I was going to say “telling me to slow down” but I don’t go very fast anyway .If I went any slower I would come to a stand still. However, in my slow way, I potter around a great deal and rarely sit down except for meals or when I am driving. To appease the Gods of Dizzy, on Saturday I had a rest on the sofa which the dog thought was wonderful. “Yay, she’s sitting still. We can snuggle” seemed to be the message from a delighted pooch. Yesterday, I went to the hairdresser where I had a lovely sit down for 30 minutes. And, today, I am forcing myself to sit down at the computer. Usually, I stand to work at the computer. Why? Bad habits, I suppose. And it’s easier to multi task that way. So, although I am feeling fine and undizzy today, I do feel in need of quiet and one thing that says quiet to me is this photo that I took, last year, in my pre-blogging days. 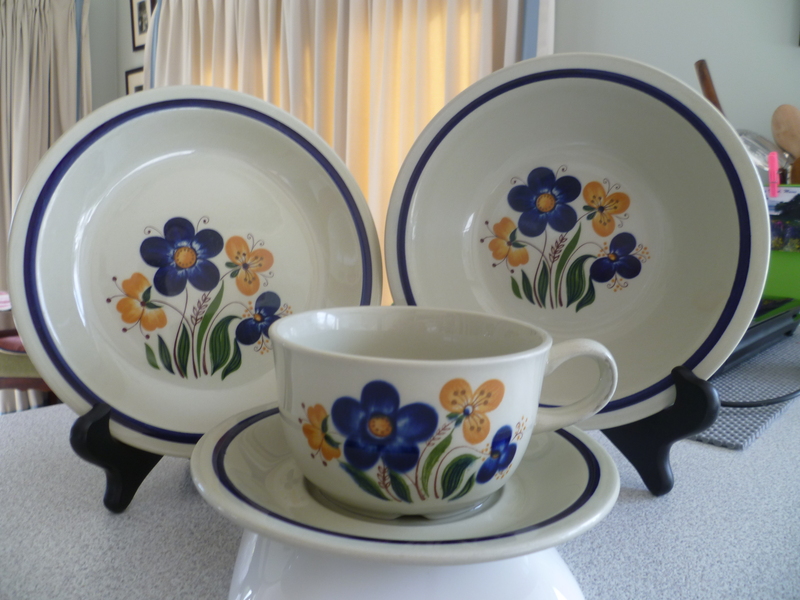 In the photo, you can see a small breakfast set that I have had for more than 30 years. (It’s been with me longer than my husband!) Why does this say “quiet” to me on this day? I am not sure. Is it the design, the colours, the shapes or the associations? Or all of these things? And that is all I will write because today is for quiet moments and memories and contemplation. China note: The pattern is Mayflower and the china is made by Figgio of Norway. 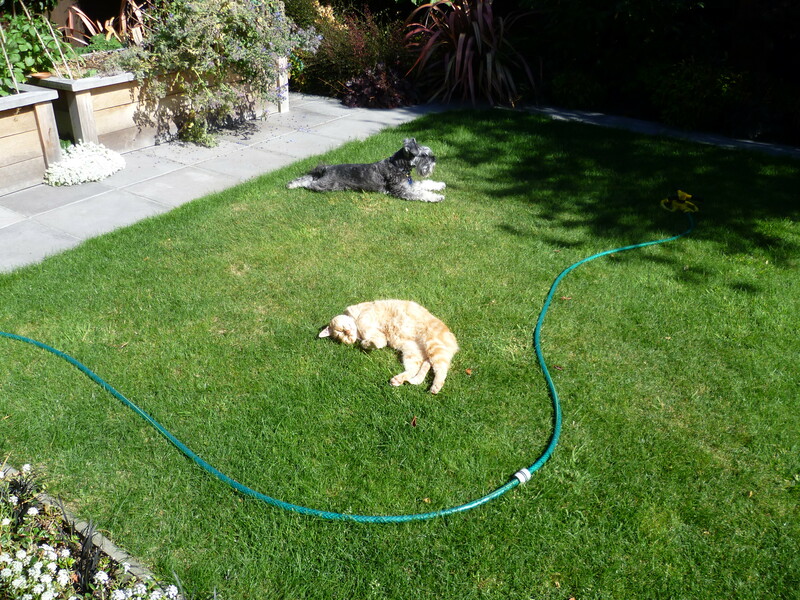 This entry was posted in Domestic, Flowers, Gallivanting, Memories and tagged © silkannthreades, children, china, dogs, family, napping, Norway, peace, siesta, South Pacific, tropical on February 18, 2013 by Gallivanta. If I want to understand how to age well, I need look no further than our heritage trees. As each decade passes, they grow more and more beautiful. They thrive as they mature. Their foundations become firmer, their trunks and limbs, with a little judicious pruning, grow stronger, and they stand tall, and mostly straight, with body and tree memory in tact. How do they do it? In my previous post, I wrote about the oldest exotic tree in Christchurch which can be found in the grounds of Riccarton House. Although the tree is well over 150 years old , it is thriving and bearing fruit. 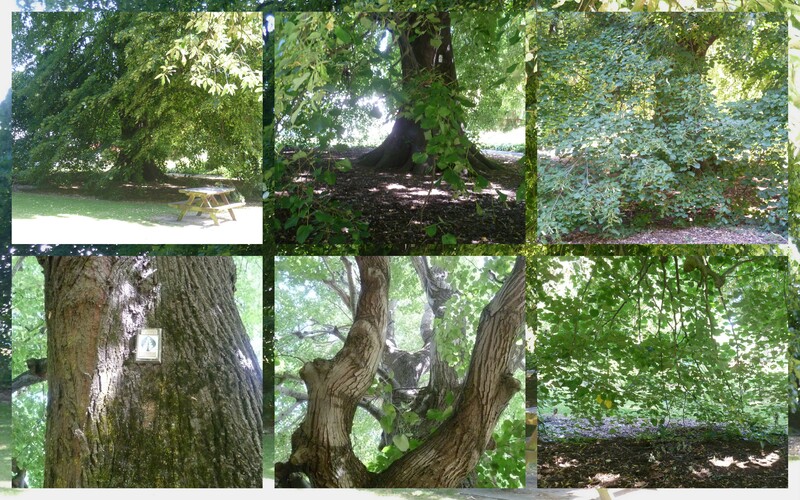 There are many other notable trees around Riccarton House. One of the” younger” heritage trees is the magnificent Weeping Lime which was planted in 1855. Here are some images of the Weeping Lime. It was hard to capture the size of the tree. And equally difficult was obtaining a photo which caught the wondrous green tent created by the weeping branches. It was so lovely under the canopy that I wanted to lie down next to the trunk and dream away the afternoon. A few metres away from this tree of loveliness, is a special protected area known as Riccarton Bush. It is home to the last remnant of 300,000 years of floodplain forests and is possibly the oldest protected area in New Zealand. 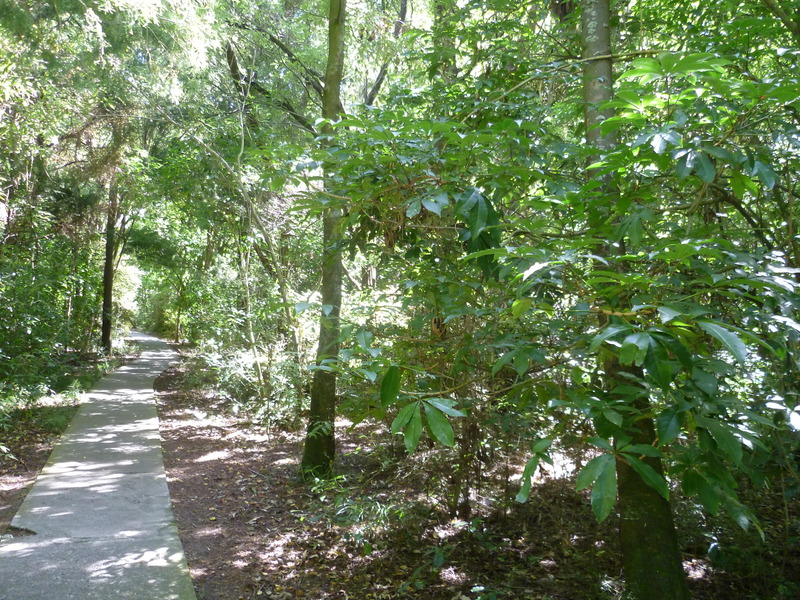 In Riccarton Bush we have the privilege of experiencing primeval forest in the midst of an urban landscape. Whilst the exotic trees amaze me with their age, the native, primeval forest is truly incredible. 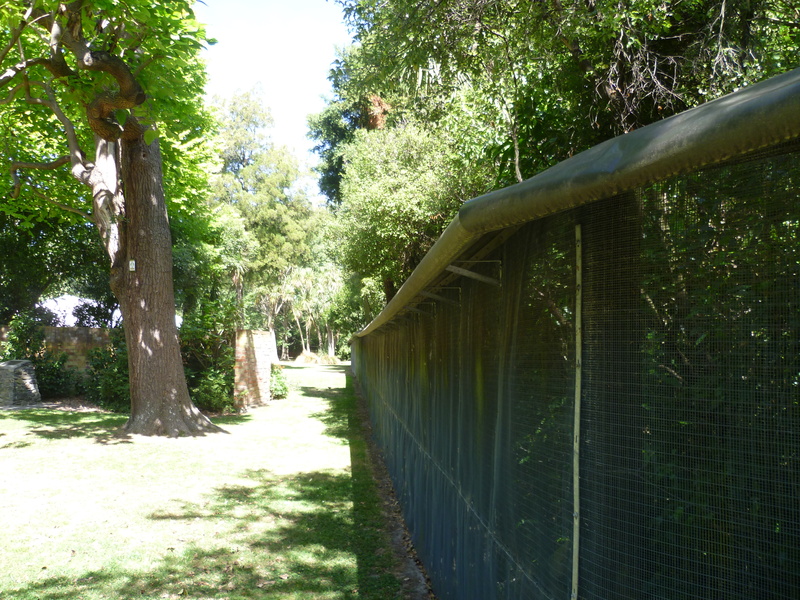 Inside Riccarton Bush there are kahikatea trees which are 600 years old. 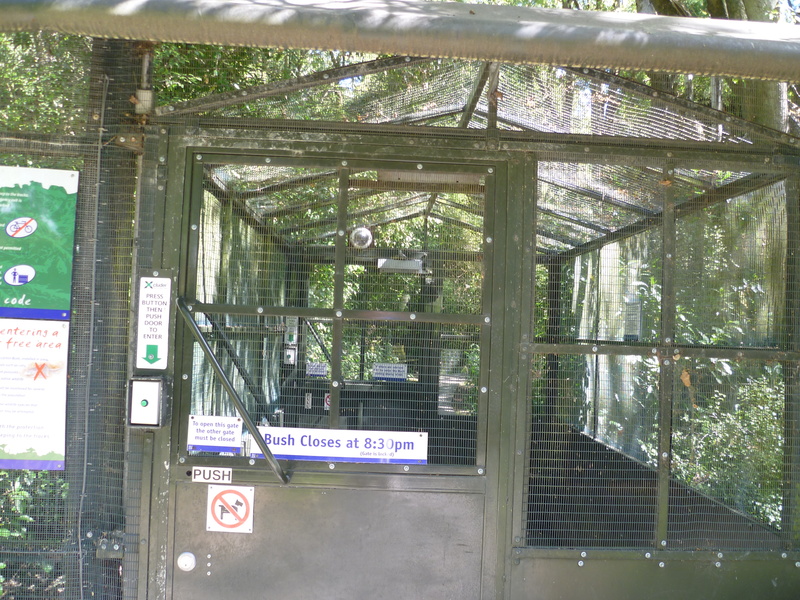 I didn’t have time to photograph these trees but here is a glimpse of the entrance to the protected area and the start of the walkway through the Bush. and onward to a wonderland. John Deans, farmer and lover of trees, who settled at Riccarton Bush, requested before his far too early death in 1854, that this native area should be preserved and protected. The family honoured his wishes and now our city does too. So, back to my question. How do trees age so well? Here’s a few my thoughts: they source their food locally; they consume only what they need ( have you ever seen an overweight tree? ); they exercise moderately apart from the occasional vigorous workout in a gale; they engage with their environment and are open branched and hospitable, and giving; they are even-tempered (ever seen a tree giving out the equivalent of road rage even when we pick at its leaves, carve its bark, leave our rubbish about , are loud and abusive within its presence, and climb all over it? ); they are tolerant and share their shade equally with the least and the greatest; they are creative (look at their intricate shapes and textures); and they know how to adapt and incorporate and store each year’s learnings into a type of wisdom and knowledge that ensures they will survive and thrive for centuries. And as with people, trees age even better if we offer them love, affection, freedom and dignity to age at their own pace. Wow! I am going back to the Weeping Lime some time soon to see if ,by standing under its canopy, I can breathe in some more of the art of ageing treefully. This entry was posted in education, Fruit, Gallivanting, Memories, Trees and tagged ageing, © silkannthreades, botanic, change, gardens, heritage, living well, nature, parks, primeval forest on February 16, 2013 by Gallivanta.